Vanilla has quite a past. It has everything a dramatic novel could want, a twisty turny plot that opens in Mexico in the 15th century. If this was a play the curtain would open on a scene of the Totonaco Indians that inhabited the Mazantla Valley on the Gulf Coast of Mexico. Riveting stuff this vanilla history. When the Aztecs conquered the Totonac tribe they discovered the wonders of vani8lla and required the Totanac tribe to offer vanilla beans as tribute. Later when the Aztecs were defeated by the Spaniard, Hernando Cortez history repeated itself and they were required to provide the vanilla plant and beans to the Spaniards. Cortez brought vanilla to Spain and the love affair began. It wasn’t long until royalty was drinking a mixture of vanilla with cacao and vanilla was in high demand. It was Queen Elizabeth I’s court that suggested that vanilla be used as a flavoring and the love of the bean grew from there. 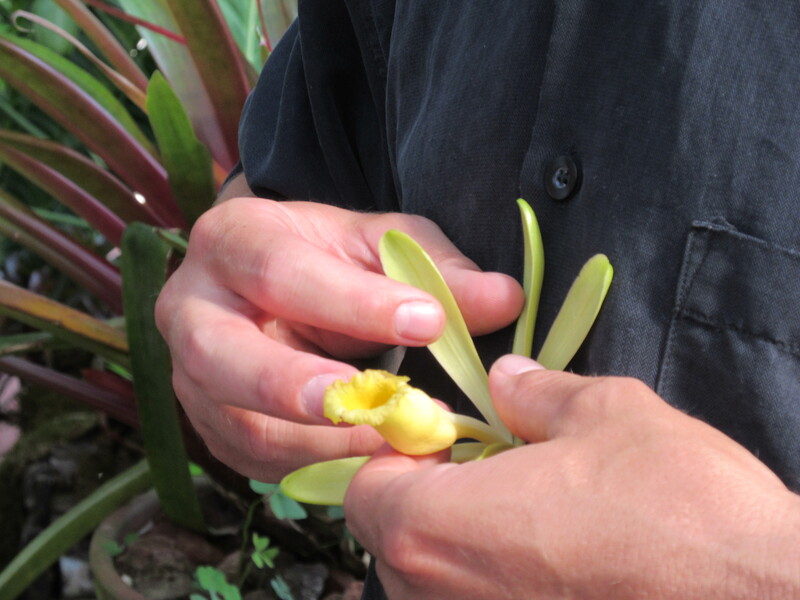 Vanilla became a truly viable crop after the French introduced vanilla to the Réunion and Mauritius islands and Edmond Albius, a 12-year-old slave from Réunion Island discovered how to pollinate the flowers by hand. The actual name “vanilla” comes from the Spanish word “vainilla”, meaning “little pod”. The vanilla beans are also referred to as pods or “black flower”, after the mature bean, which shrivels and turns black shortly after it is picked. The lovely tropical orchard that produces the beans can be found at the Pureto Vallarta Botanical Gardens. It was quite shocking when Director Gerlowski told us that several orchids grow wild in Mexico and because of the value of orchids, poaching has become a problem that the Mexican version of the EPA has had to deal with this issue. In fact, the day we were there, an environmental representative brought a load of orchids that had been taken from a poacher or poachers. The hope is that at the garden they will be able to keep the orchard orchids growing. Poachers have become brazen and even cut down whole trees where the orchid vine grows orchids grow. Director Gerlowski noted that not all orchids occur as vines on trees, several grown as epiphytes. Vanilla and the other orchards are just one of the attractions at this lovely place where once cattle grazed. Flowers grow and research is performed. The beauty of the place opens it as a great wedding destination and the views are spectacular. As the curtain falls on the vanilla drama, at the gift shop my friend Linda and I both loaded up with vanilla to bring home to the states. The vanilla was tucked protectively in our bags surrounded by dirty clothes as we headed home with thoughts of flowers, trailing vines and vanilla raiders running through our heads. log onto http://www.vbgardens.org/about-us/ for more information about this beautiful place. Previous Post: Writers at the Strawberry festival, a literary event!